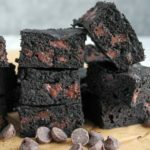 The darkest, most intensely chocolatey brownies ever! Made in one bowl with dark cocoa powder, they'll satisfy all your late night chocolate cravings. Preheat oven to 325 degrees F. Grease an 8x8 inch baking pan (or line with parchment for easier removal) and set aside. In a large bowl, melt the butter in the microwave (or in a saucepan on the stove, if you prefer). Whisk the cocoa powder and espresso powder into the melted butter until smooth and glossy, and let sit for about 2 minutes. It should smell intensely chocolatey. When the mixture is slightly cooled, whisk the eggs in one at a time. Stir in the sugar, salt, and vanilla extract until fully blended, but don't whisk too vigorously or you'll add a lot of air to the batter and the brownies won't be as fudgy. Stir in the flour until just combined, then fold in the chocolate chips. Scrape the batter into the prepared pan, and sprinkle coarse sea salt over top if desired. Bake for 30 minutes. The brownies should have a dry, shiny crust. Let them cool in the pan for at least 30 minutes (they will continue to cook and firm up a bit in the pan). Cut into 16 brownies and enjoy! Recipe somewhat liberally adapted from Dorie Greenspan's Tribute-to-Katharine-Hepburn Brownies in Baking: From My Home to Yours. *Please note, the dark cocoa powder I used was Hershey's Special Dark, which is a mixture of natural and alkalized or "Dutch process" cocoa. I don't recommend substituting a Dutch process cocoa alone here (if you don't know what I'm talking about, don't worry - normal American cocoa powder is the so-called "natural" variety and works perfectly in this recipe).